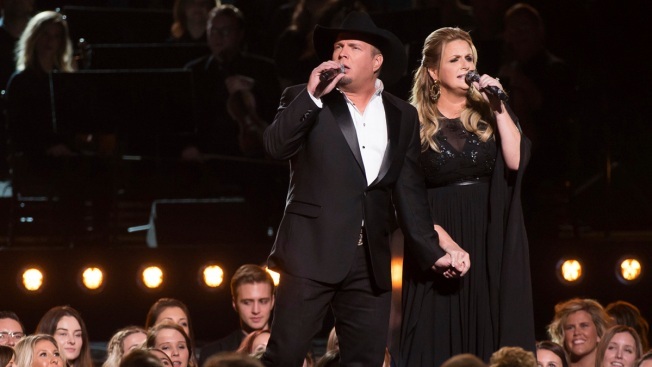 Garth Brooks, left, and Trisha Yearwood perform at the 50th annual CMA Awards at the Bridgestone Arena on Wednesday, Nov. 2, 2016, in Nashville, Tenn.
Music fans who tune in to the Country Music Association awards next month will get to hear performances by the reigning Entertainer of the Year and the singer coming in with the most nominations. Garth Brooks, Brothers Osborne, Luke Bryan, Eric Church, Alan Jackson, Miranda Lambert, Little Big Town, Old Dominion, Jon Pardi, Chris Stapleton, Thomas Rhett and Carrie Underwood will all take the stage. Lambert leads the pack with five nominations, with Little Big Town and Keith Urban earning four nods each. Brooks returns this year with his 12th career nomination for CMA Entertainer of the Year, a title he has won five times, including last year. Underwood and Brad Paisley will host the live awards at the Bridgestone Arena in Nashville, Tennessee, on Nov. 8.